In 2005, construction at 30 Spear Street in Downtown San Fransisco exposed the remains of a ship buried beneath the city. 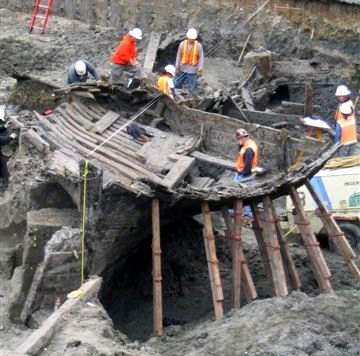 A view of the stern of Candace during excavation. William Self Assoc. Inc. The old waterfront of San Francisco, landfilled after the California Gold Rush in the 1850s, is now the heart of the city. 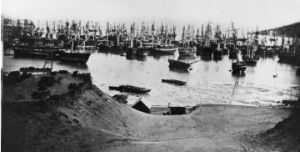 The landfilling left dozens of ships sepulchred beneath the city’s streets and sidewalks. Since the 1970s I have been involved in digs where these ships – as well as collapsed buildings – have been encountered and archaeologically studied before construction proceeds. 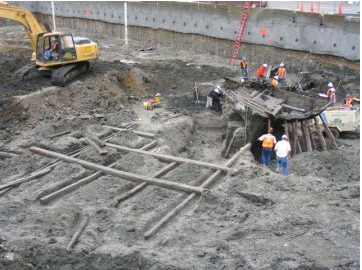 Most of these projects have been with my good friend Allen Pastron’s firm Archeo-Tec, who pioneered these types of digs and who have literally exhumed and documented the early history of San Francisco. In 2001, at Allen’s invitation, I worked with his team as their maritime archaeologist on the excavation of the ship General Harrison. “Abandoned ships” off Rincon Point, as seen from Happy Valley, from a panorama of San Francisco, 1851. San Francisco Maritime National Historical Park, J. Porter Shaw Library, A11.16541 n.
Another archaeological firm that has done work in downtown is William Self Associates. Jim Allan, another good friend and fellow archaeologist, is Vice President of WSA and maritime archaeologist for the firm. 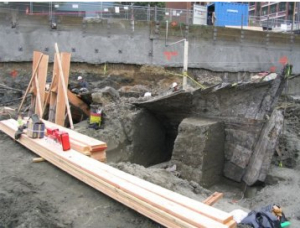 Jim excavated the ship Rome, a Gold Rush hulk buried and found near Market Street during tunnel boring for the subway, and in 2005 handled the 300 Spear Street ship. I was in Estonia diving on the wreck of the ironclad monitor Russalka when the 300 Spear dig was underway, but heard about the find on the Internet. Late in the year, Jim contacted me to ask for help in identifying the ship they had excavated. How could I say no? Initially, the clearance of the old ships involved burning. However, burning the ships proved wasteful because there was money to be made from salvage. While ship breaking was a labor-intensive and upleasant job with a low margin of return, the proximity of a nearby, cheap labor force provided the means to an end. That labor force was a group of approximately 150 Chinese who lived in a fishing village at the southern end of Rincon Point. Rows of old hulks were moored off Market Street Wharf, maritime relics of “49.” That was “Rotten Row.” One by one, they fell victim to Hare. Hare purchased them, set Chinamen to picking their bones, broke them up, put the shattered timbers in one pile, the iron bolts in another, the copper in another, the cordage in another, and so in a short time all that remained of these bluff-bowed, old fashioned ships and brigs…was so many ghastly piles of marine debris. The beach at the Rincon exhibits a scene which recalls the past in a most affecting manner. In almost every portion are to be seen the relics of old ships, that once braved the storms and dangers of a hundred seas, being broken up for their old iron and fire wood. This work is carried on chiefly by Chinamen, who hammer and saw and chop, day after day and week after week with the most exemplary patience and perseverance. Under their continued blows, the old vessels fall to pieces, one after the other. For a few days the yawning wrecks and then the bare skeletons of keel and ribs are seen; but in a short time the skeletons themselves fall to pieces; the iron and copper are stored, the wood piled up and carried away, and not a vestige of the once mighty masters of the deep remains. The wooden platform in the foreground was probably used by the shipbreaking yard workers as they broke up Candace. William Self Assoc. Inc. This suggested to me that the vessel Jim Allen and WSA had excavated was one of those five ships, as they were digging in the heart of Hare’s old yard. The wreck found in 2005, not completely broken up, would have been the last ship to be torn apart in the shipbreaker’s yard. From old records, I knew the site had been filled over by 1859-1860. The vessel was exposed in open water for some time, because there was damage to the wood from teredo worms that had stopped with the burial of the vessel. That would make sense for a ship broken up and abandoned in February 1857 and left in tidal waters for two to three years. Jim’s team documentation of the vessel showed that it was an American-built vessel built around 1820-1830, perhaps slightly earlier, but not before the War of 1812, and was approximately 100 by 25 feet. Working from their measurements and 19th century insurance company specifications for shipbuilding, I determined that it was a vessel with a registered tonnage of approximately 300 tons. If it was one of the final five ships broken up by Hare, it could not be the 212-ton Fortune, the 387-ton Regulus, or the 508-ton Panama. It therefore had to be either the Massachusetts built, 1826 barque Harvest, an 1849 arrival later used as a storeship off Long Wharf (Commercial Street), hauled to Rincon Point by 1852 and broken up in 1857, or Candace, a 309-ton ship built in Massachusetts in 1818 which arrived in San Francisco in 1855 after a long career as a whaler. Damaged and condemned, the vessel was sold at auction and broken up off Rincon Point in 1857. This ca. 300 ton barque is a close match for either Candace or Harvest. It is moored at what today would be near the intersection of Spear and Folsom streets. The barque lies off the Folsom Street alignment; the line of capped pilings visible behind its stern is the property line of the waterlot. 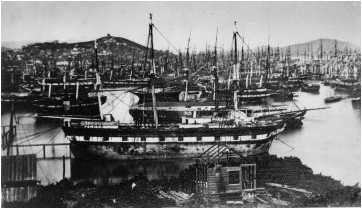 They outline the southern boundary of Folsom while the vessel lies across the Spear street alignment, as does the steamboat and the housed-over storeship behind (north) of the vessel. San Francisco Maritime National Historical Park, J. Porter Shaw Library, A11.4528-c.
As for which of the two, I believe the vessel excavated in 2005 is most probably Candace. Built in Boston, Massachusetts in 1818, Candace was sold to Connecticut owners in 1836 and turned from a South American trader into a whaler. She made many voyages to the South Atlantic, Indian Ocean, the Pacific, including the North Pacific Coast, and the Arctic between1838-1855. Most of her logs are at Mystic Seaport in Connecticut, whose library staff, along with the New Bedford Whaling Museum, was the key to learning more about her and identifying the wreck. * something Jim Allan said at the very end – a critical piece of evidence he held back to not prejudice my detective work – was that excavation of the stern found two sperm whale teeth in the bilge, suggesting its use as a whaler. News of the identification of Candace made headlines in San Francisco and amazingly has spread throughout the country, especially in her old ports of call in New England, a reminder of how powerful the stories of lost ships are when they reappear from the depths – or from beneath the streets, as was the case here. It’s finding the forgotten stories of ships like Candace, and sharing them with the public, that bring me joy as an archaeologist.